Exophiala spinifera and Exophiala dermatitidis (Fungi: Chaetothyriales) are black yeast agents potentially causing disseminated infection in apparently healthy humans. They are the only Exophiala species producing extracellular polysaccharides around yeast cells. In order to gain understanding of eventual differences in intrinsic virulence of the species, their clinical profiles were compared and found to be different, suggesting pathogenic strategies rather than coincidental opportunism. Ecologically relevant factors were compared in a model set of strains of both species, and significant differences were found in clinical and environmental preferences, but virulence, tested in Galleria mellonella larvae, yielded nearly identical results. Virulence factors, i.e., melanin, capsule and muriform cells responded in opposite direction under hydrogen peroxide and temperature stress and thus were inconsistent with their hypothesized role in survival of phagocytosis. On the basis of physiological profiles, possible natural habitats of both species were extrapolated, which proved to be environmental rather than animal-associated. Using comparative genomic analyses we found differences in gene content related to lipid metabolism, cell wall modification and polysaccharide capsule production. 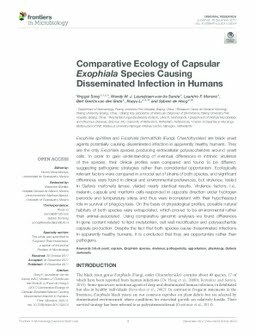 Despite the fact that both species cause disseminated infections in apparently healthy humans, it is concluded that they are opportunists rather than pathogens.